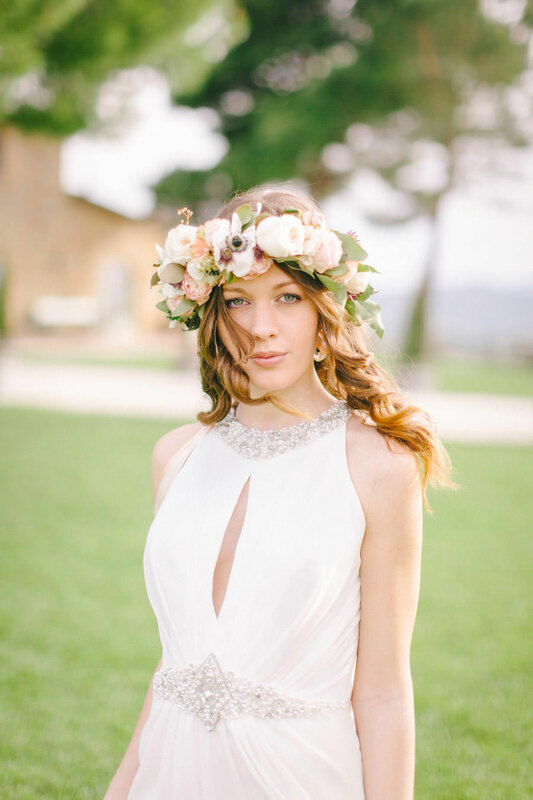 Blush, Rose & Green: A Truly Tuscan Inspired Wedding Shoot! 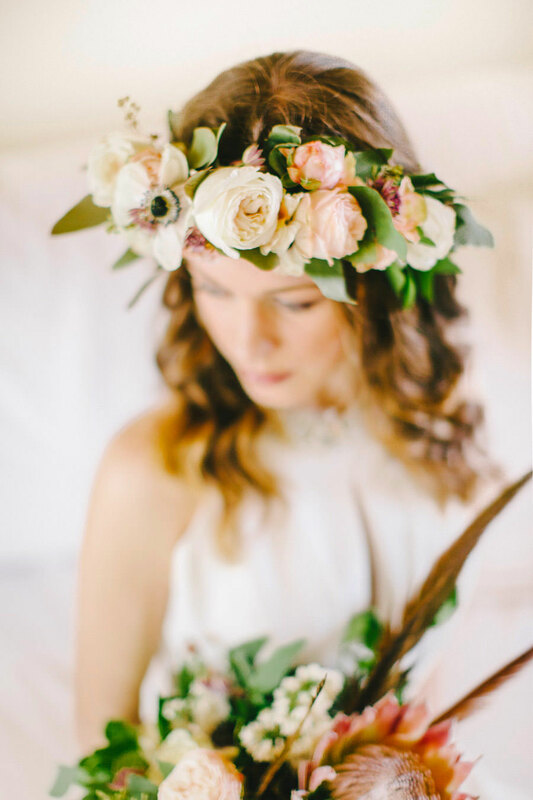 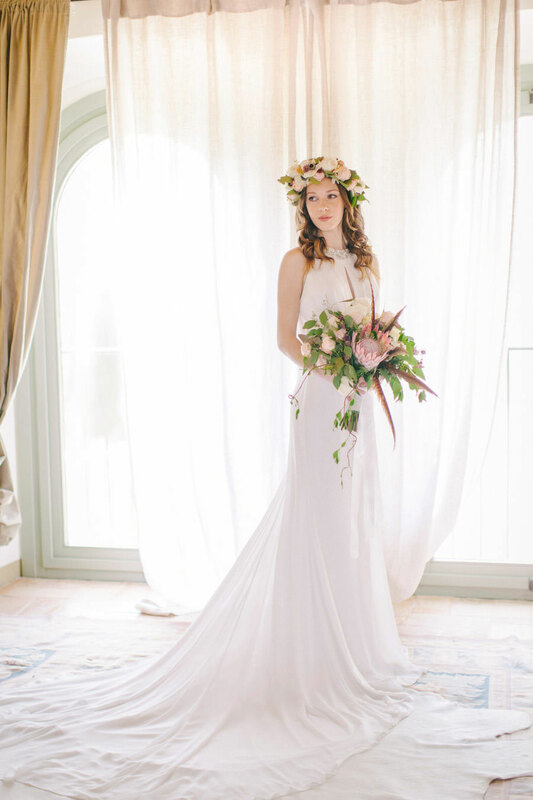 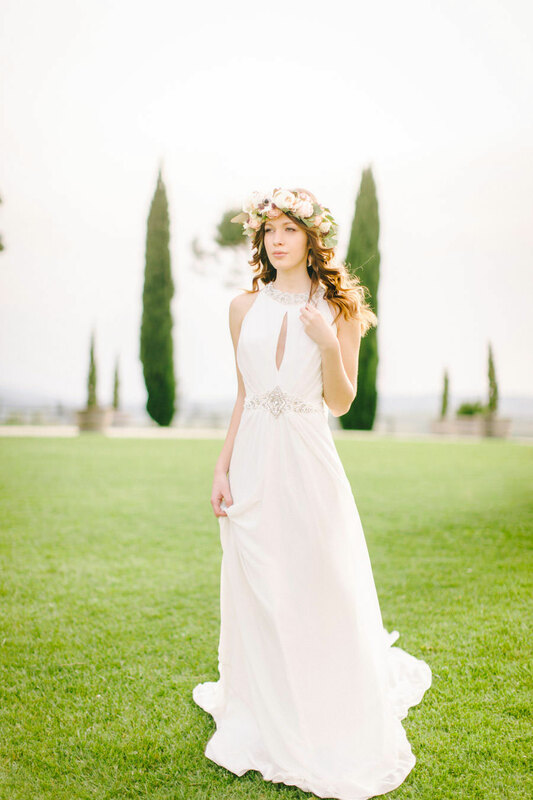 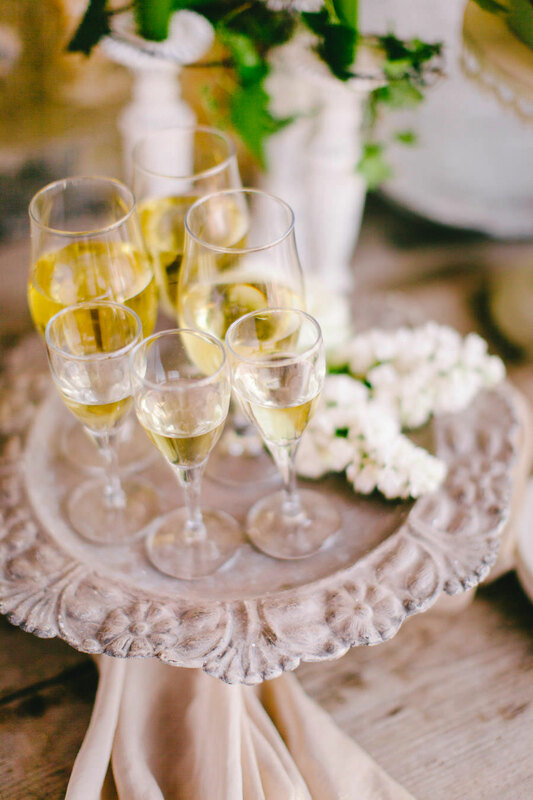 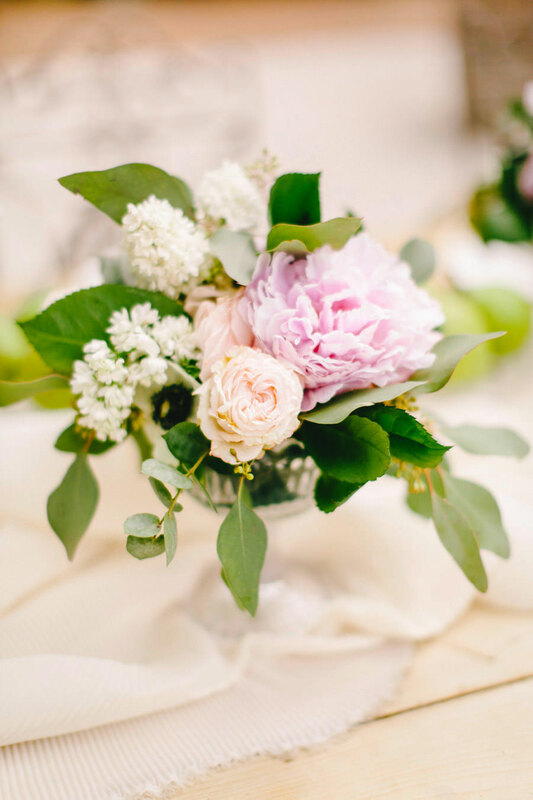 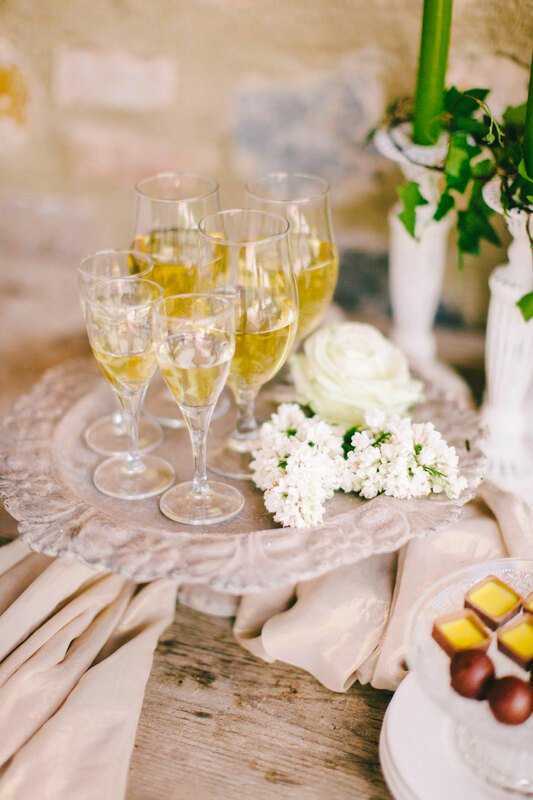 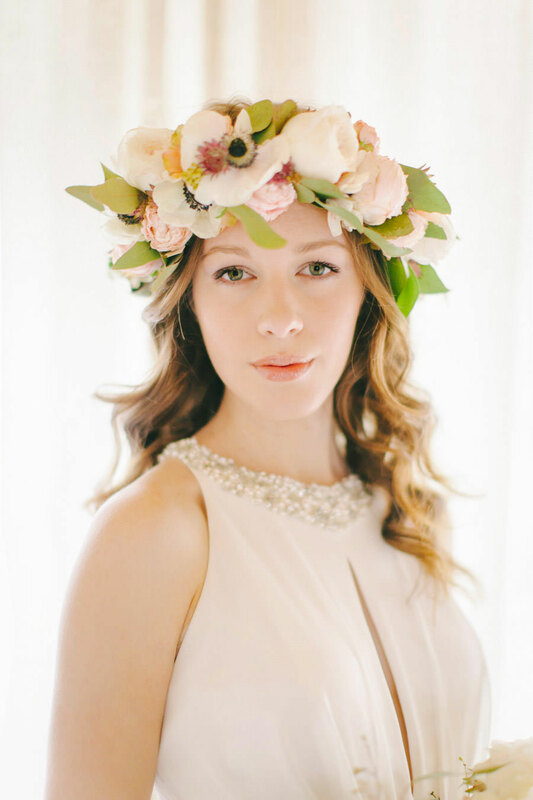 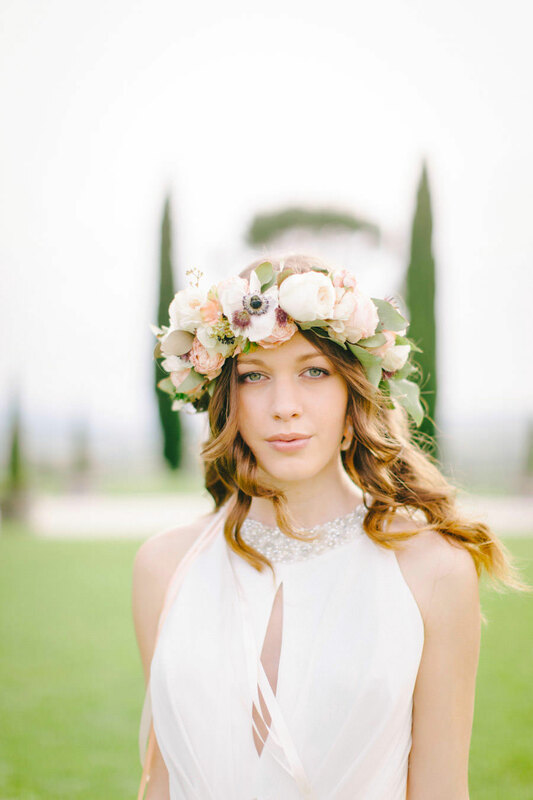 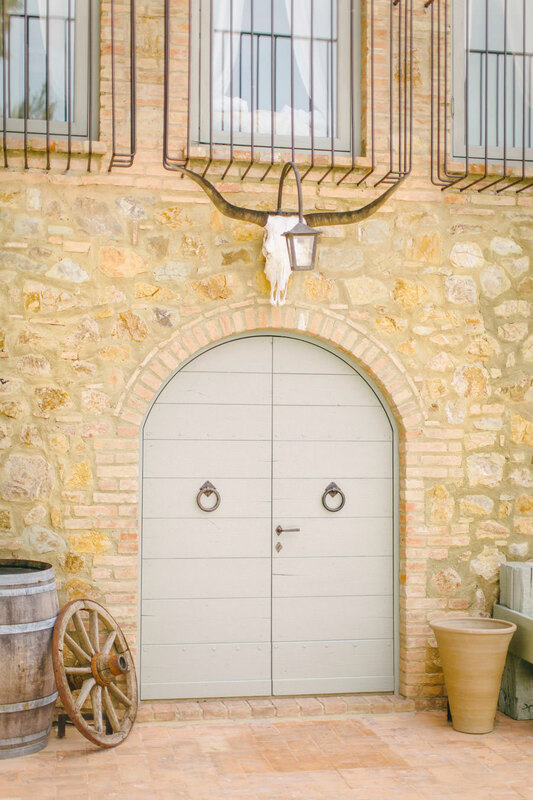 Home > Styled Inspiration > Blush, Rose & Green: A Truly Tuscan Inspired Wedding Shoot! 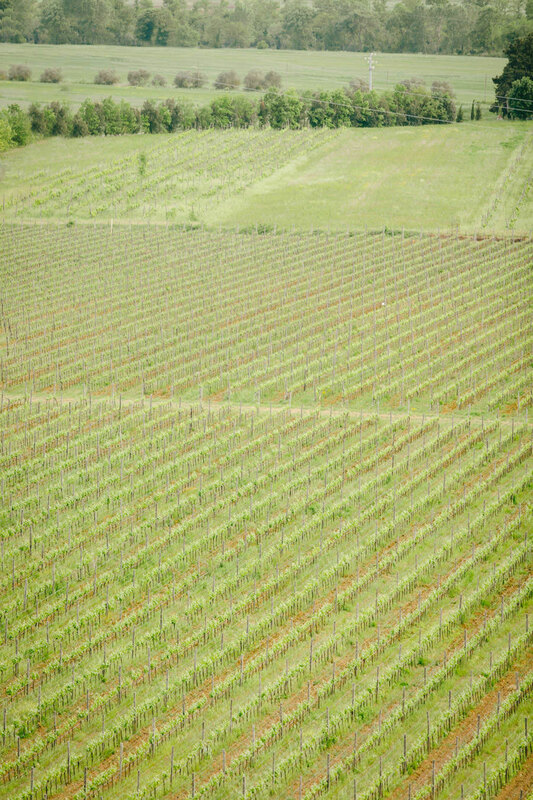 Welcome to spring! 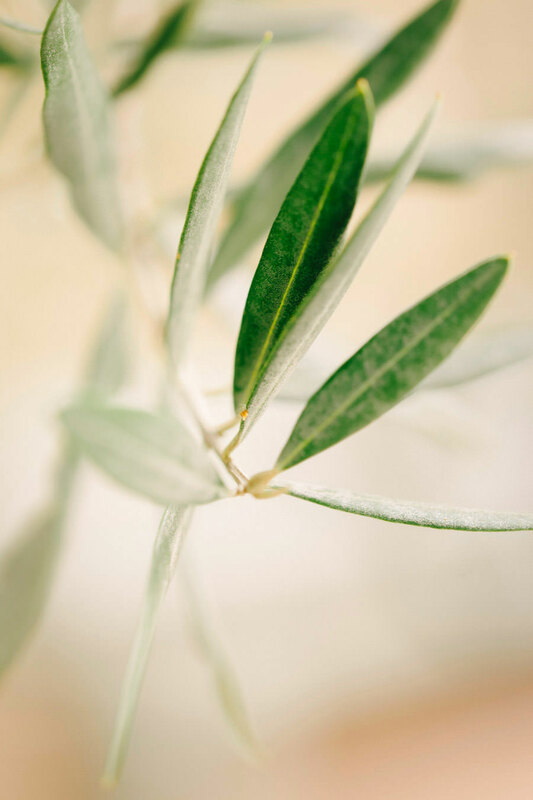 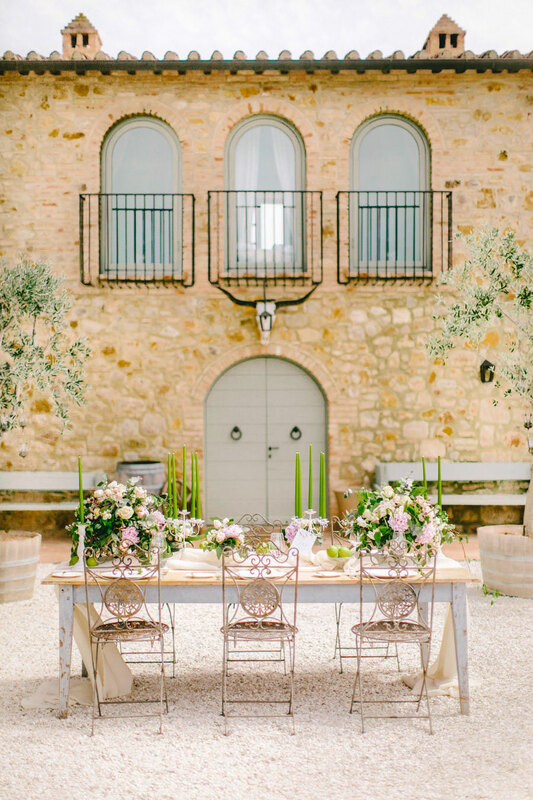 Tuscany is a wealth of inspiration, from the rolling countryside dotted with vineyards and olive groves, to the fields of poppies in the spring and the sunflower fields in the summer. 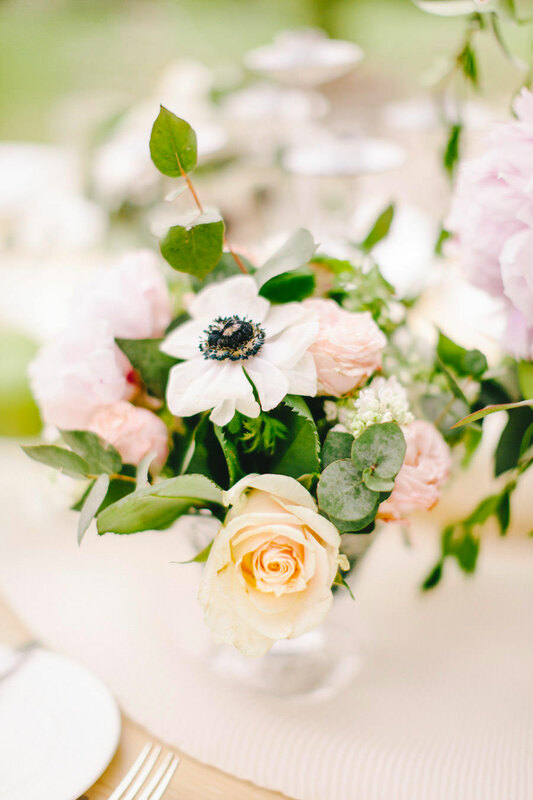 The colour palette is ever changing and always stunning! 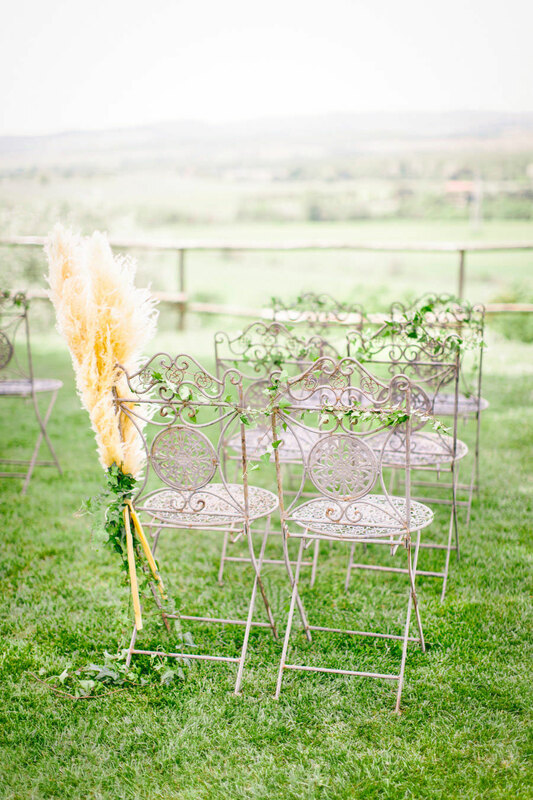 Words by Alessia B and Images by Facibeni Fotografia. 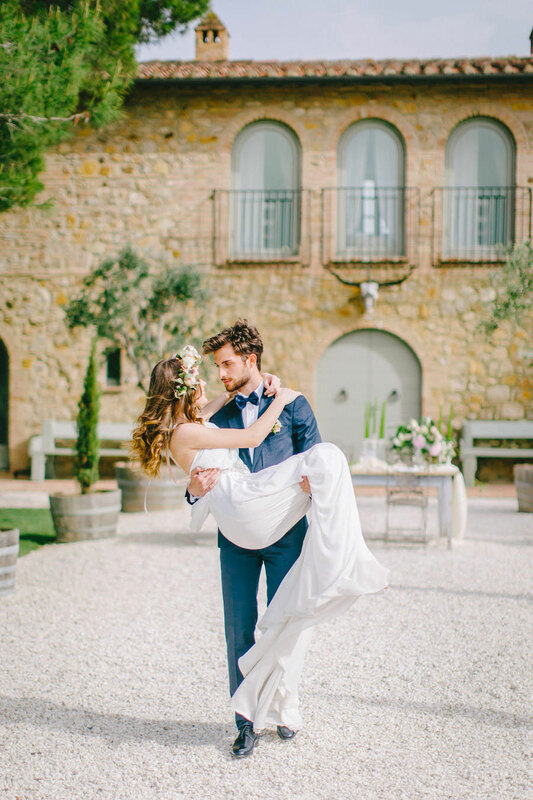 With a canvas provided by mother nature herself, we strived to ignite the imagination of future couples with a stylised vintage inspired wedding using the magnificent Conti de San Bonifico Wine Resort in the hilltops of Maremma, Tuscany as our landscape. 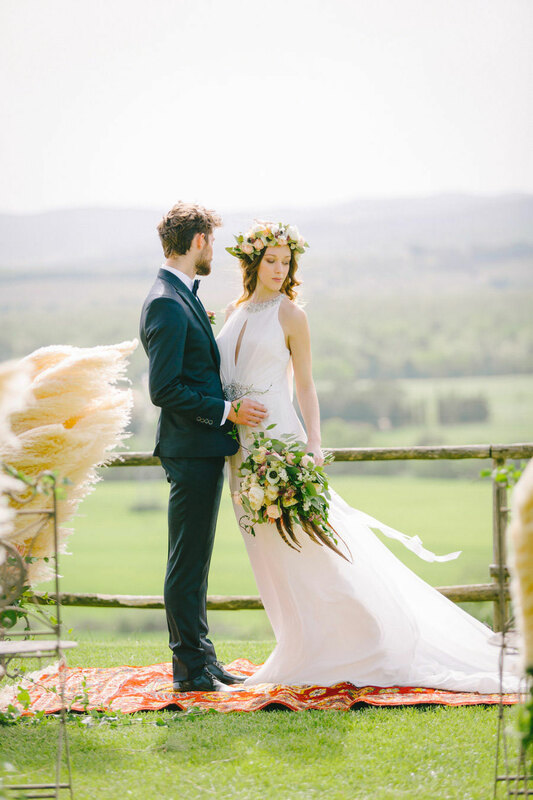 We were especially fortunate to have an engaged couple as our models capturing the feeling of infinite possibilities in the eyes of true romance. 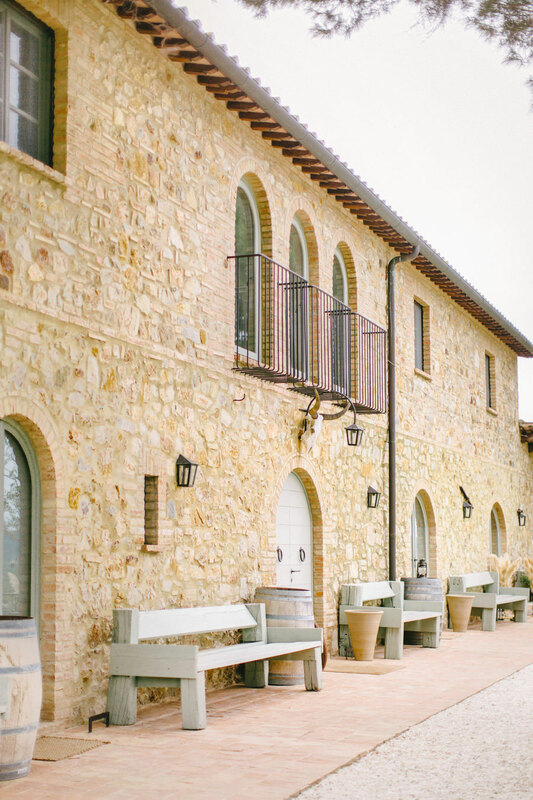 The Conti di San Bonifico Wine Resort is rustic and romantic. 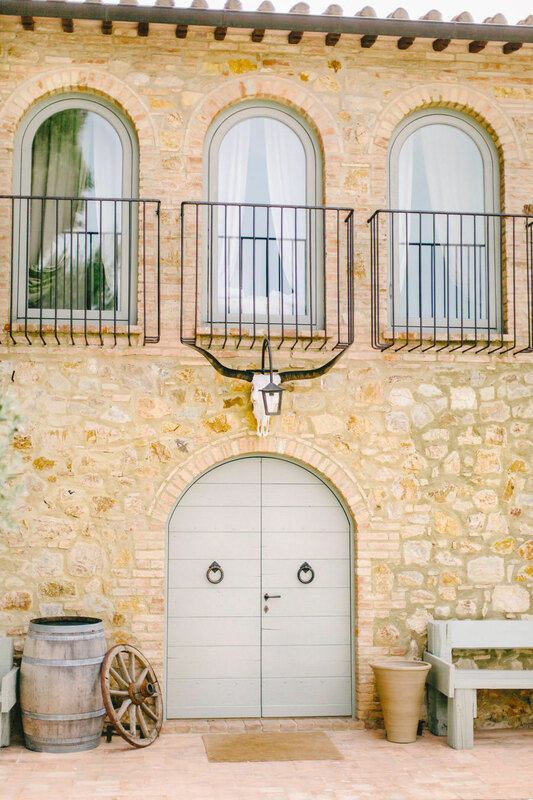 The minute you arrive, you feel a sense of peace and tranquillity transporting you to another place and time – as if an Italian Renaissance artist created the landscape just for this moment. 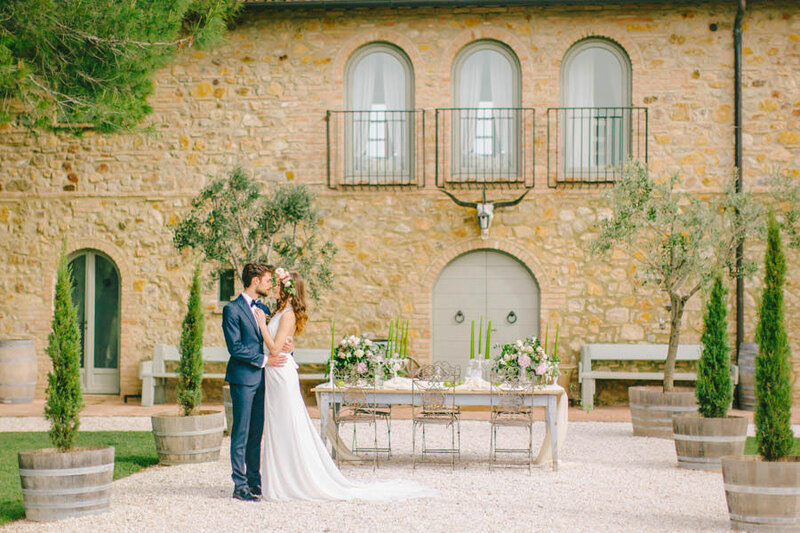 Alessia B Weddings and Facibeni Fotografia helped to envision this wedding shoot in décor, utilising colour palette and mood. 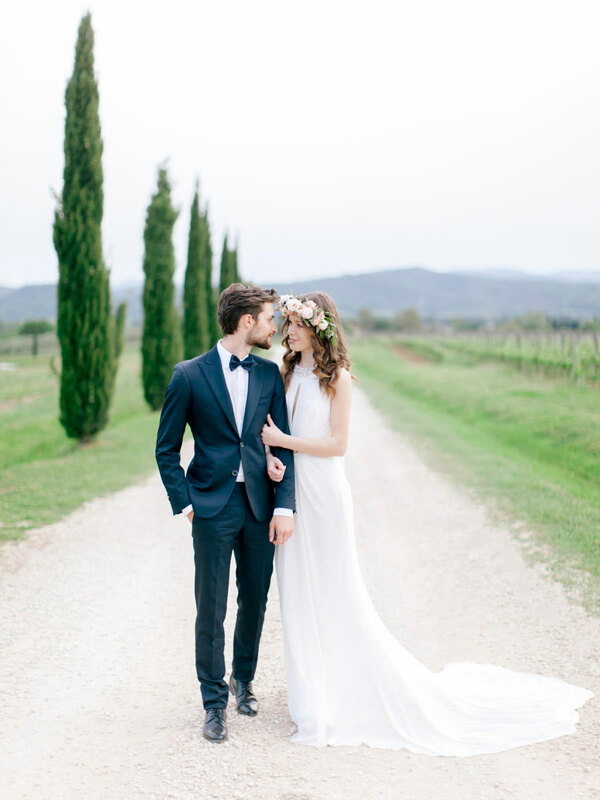 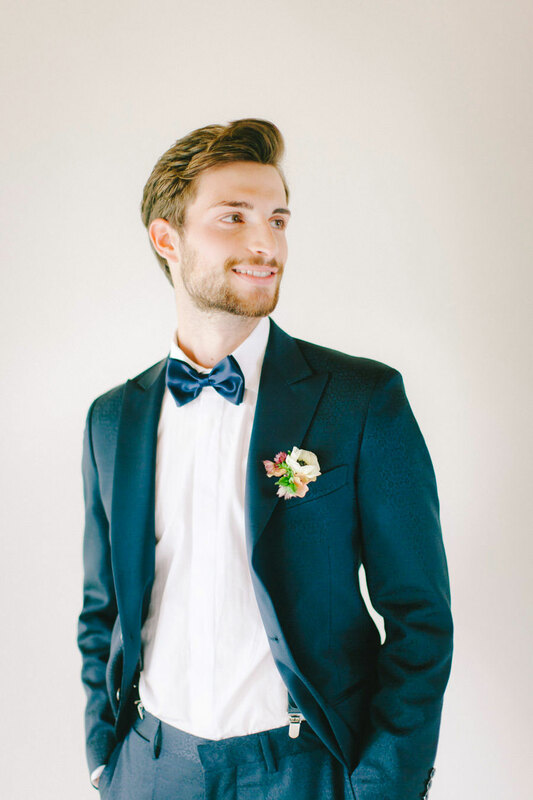 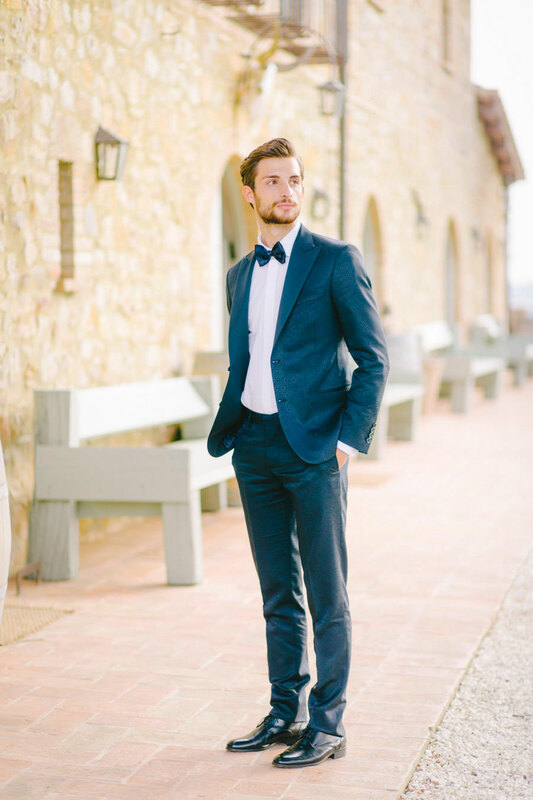 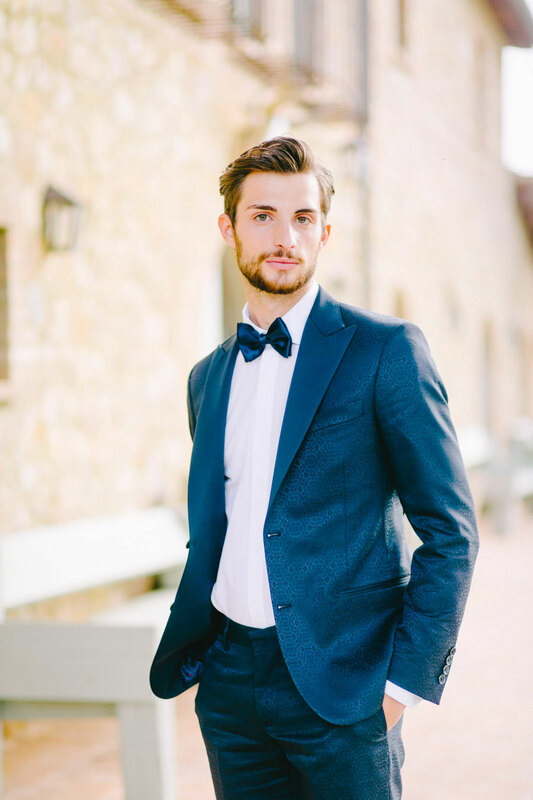 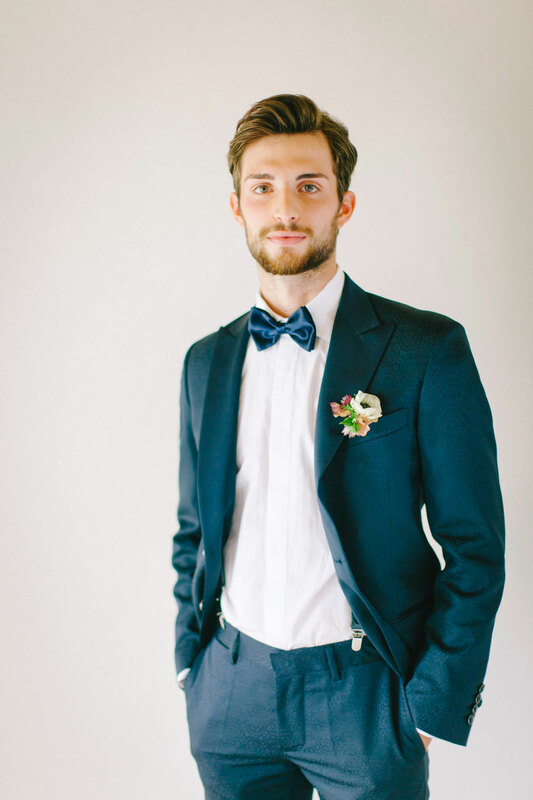 Both are natives of Tuscany and are passion utilising the gorgeous scenery in realising the perfect big day for couples getting married in Tuscany. 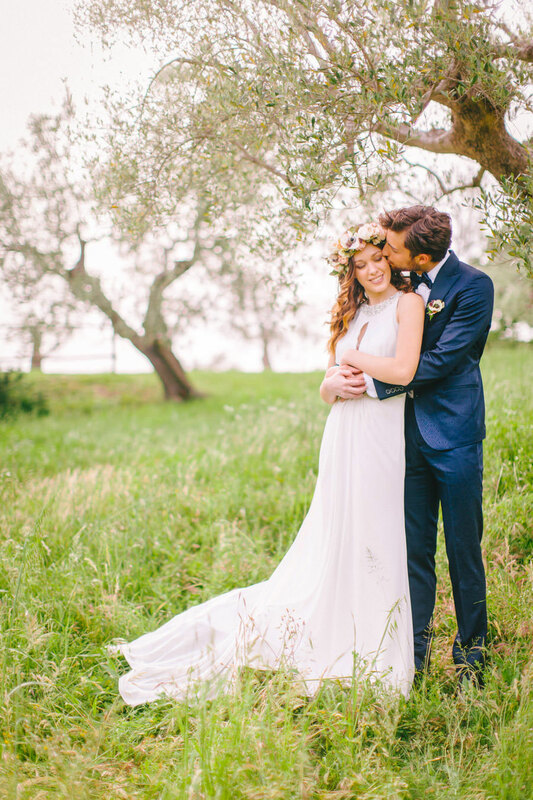 The bridal gown is a from the Carlo Pignetelli Couture collection and was provided by Il Barone Rosso. 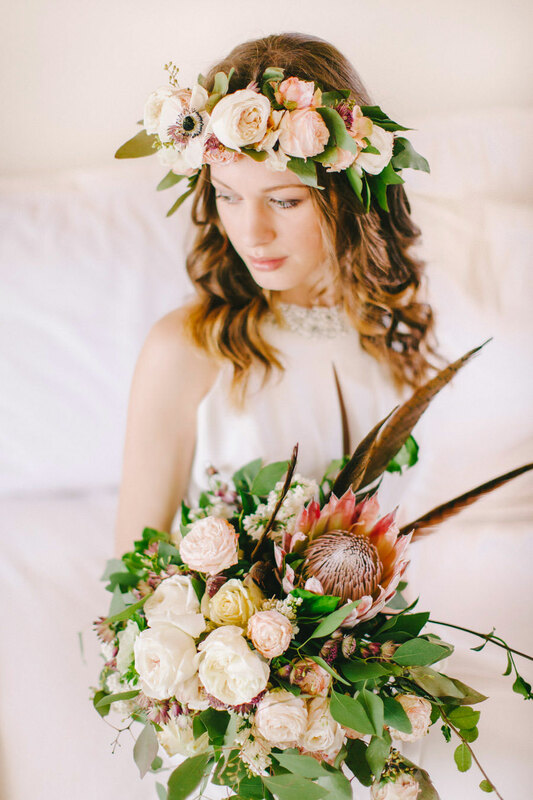 The amazing team from Stiatti Fiori assembled the beautifully rich compositions of the vintage bridal crown and bridal bouquet in country style flowers of banksia, buttercups, astrantia, eucalyptus, jasmine, anemone accented with wild pheasant feathers. 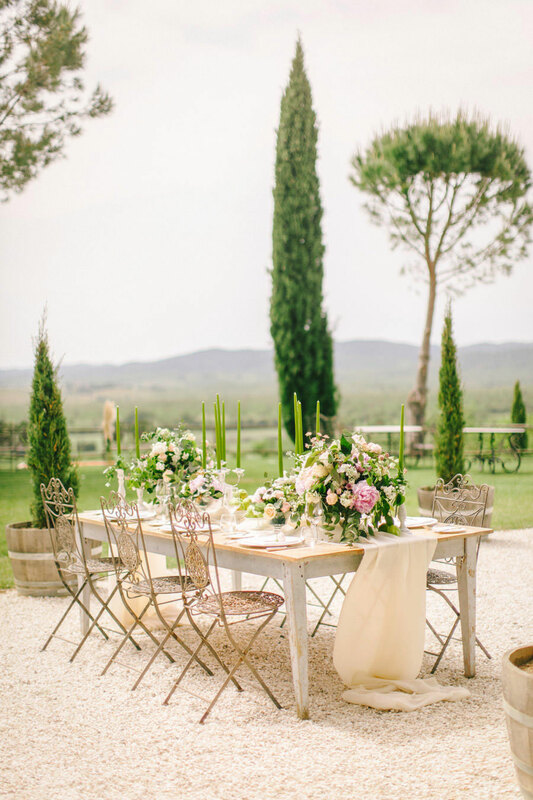 Helping to set the perfect romantic mood were the distressed wood tables, iron backed chairs and the romantically rustic table settings. 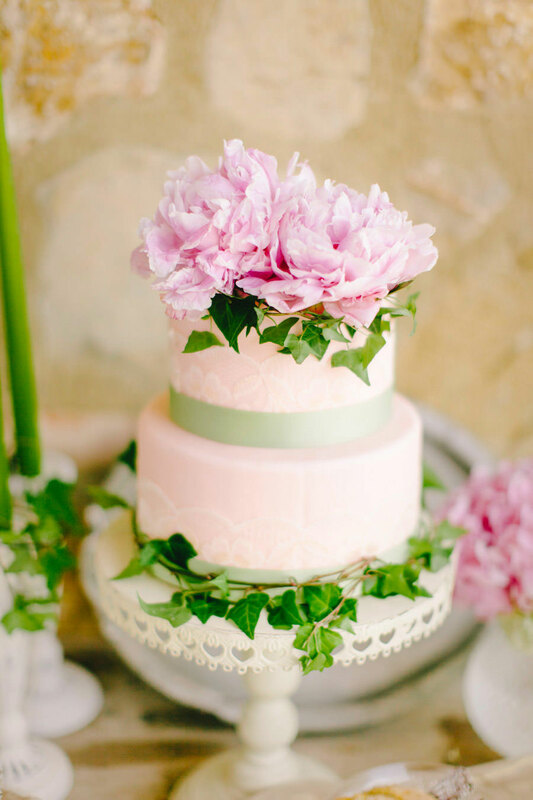 The sweets add an old-world flair to the overall mood. 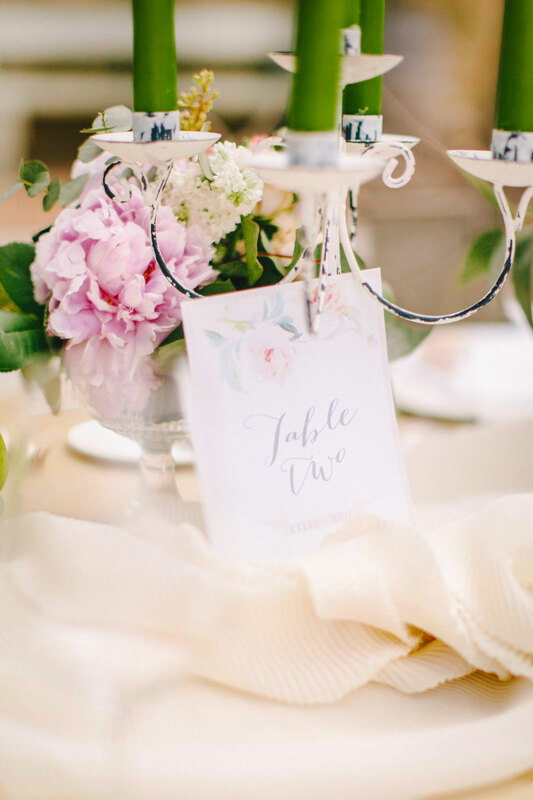 To set the perfect romantic mood for the guests, the stationery, which included place cards, invitations and save the dates used nostalgic graphics with a Victorian flair. 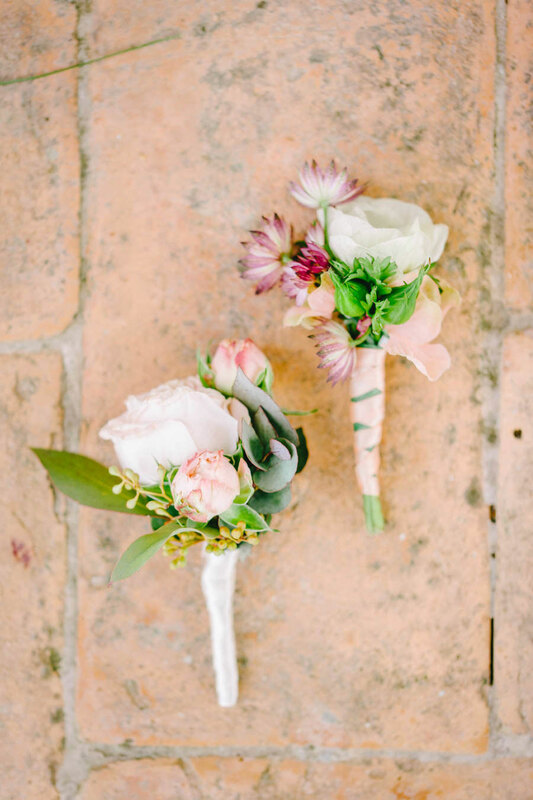 Our thanks go to the talented team listed below who brought together this beautiful Blush, Rose and Green – A Truly Tuscan Inspired Wedding Shoot for the truly romantic at heart. 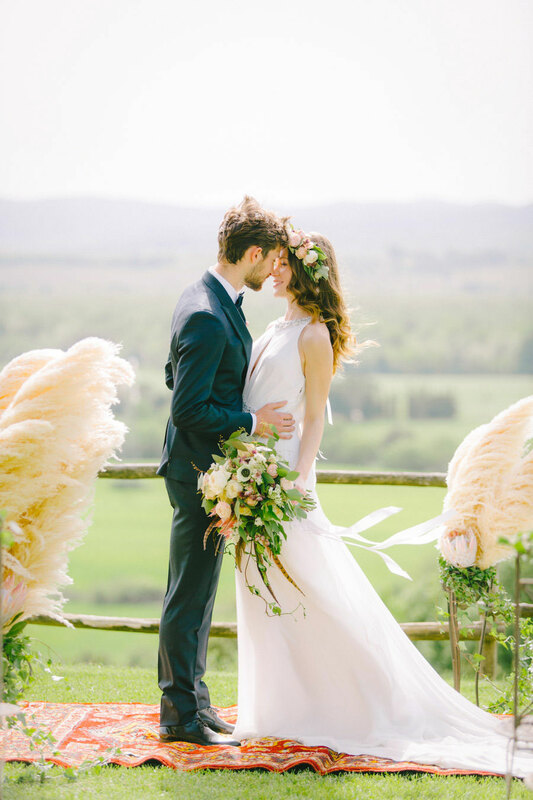 What a beautiful wedding post. 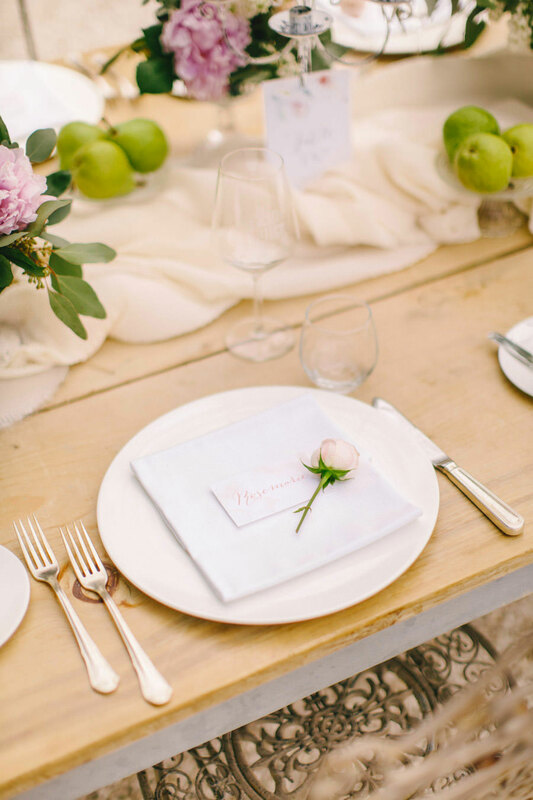 The aesthetic is so clean, fresh and summery. 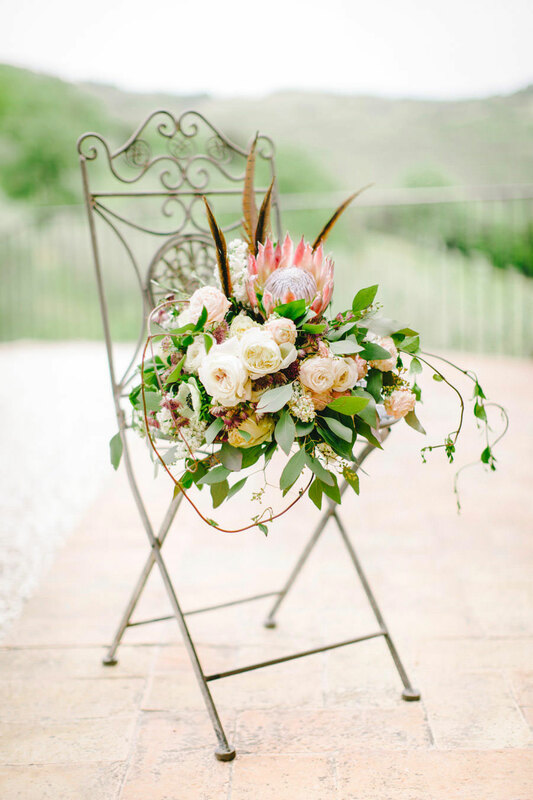 And Facibeni Fotografia has captured this perfectly. 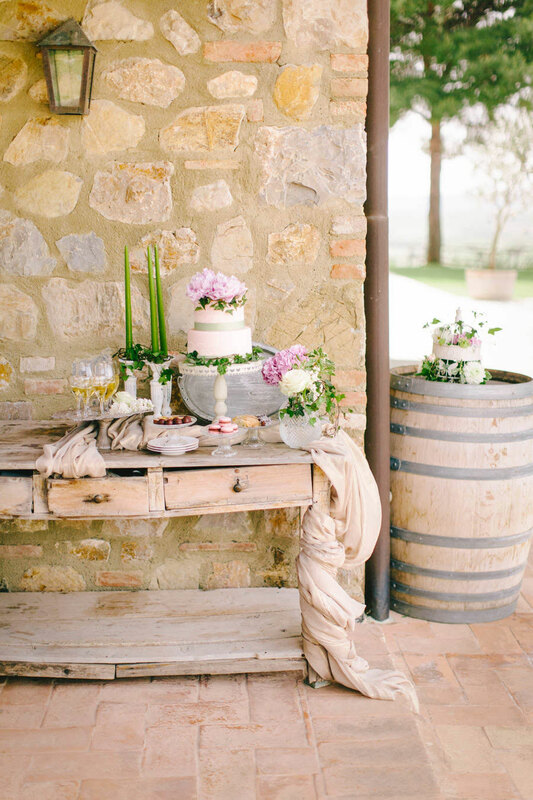 It would be interesting to know if Tuscany inspired the music played at the wedding and reception also. 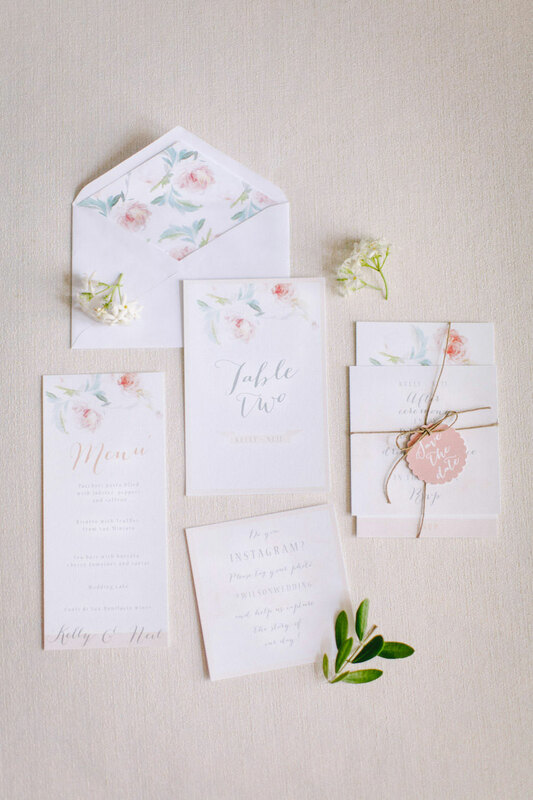 Such a gorgeous theme. 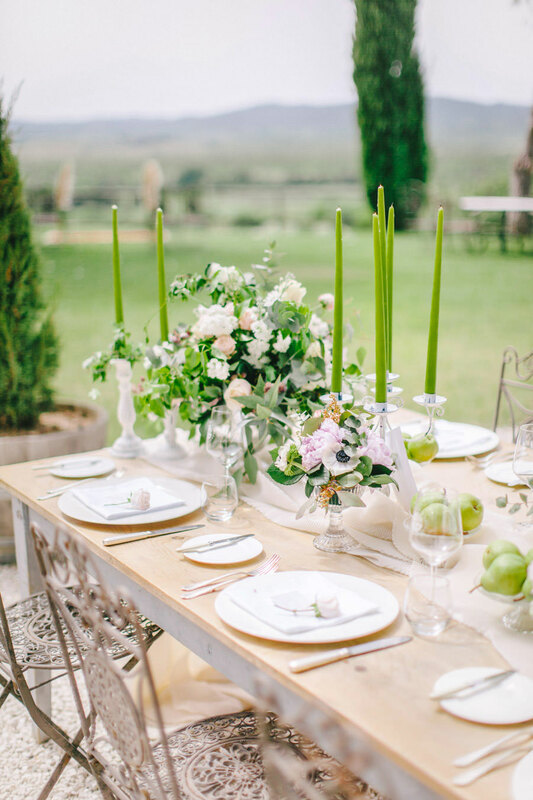 Those gardens and table setting are simple gorgeous! 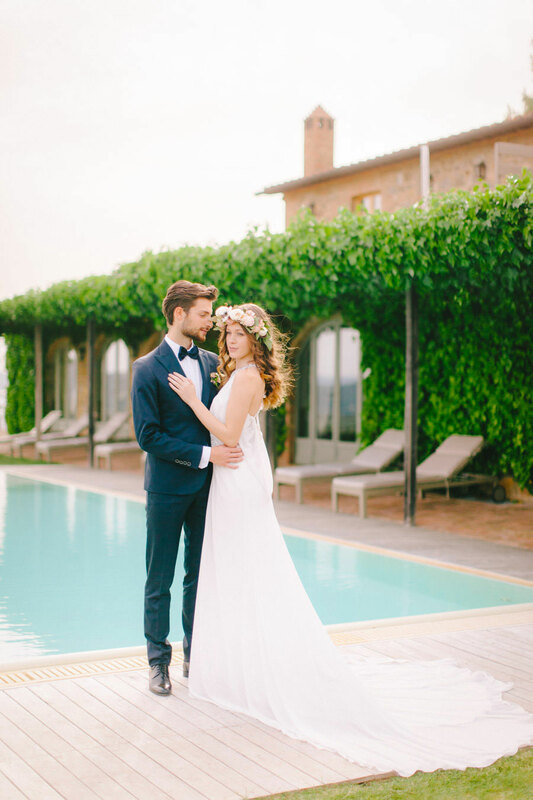 Makes me want to go to Italy!